It has been confirmed by Chancellor George Osborne that the Government will bring forward the opening of the HS2 extension between Birmingham and Crewe by six years. The extension will reduce journey times to London by 45 minutes. Under revised plans, phase two of the £55.7bn project is now scheduled to open in 2027, just one year after phase one. Transport secretary Patrick McLoughlin added: “HS2 will mean an economic transformation for the whole country. 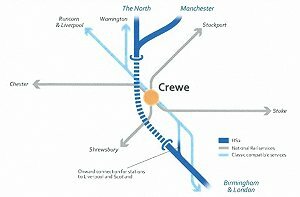 “Bringing HS2 to Crewe ahead of time is a tremendous opportunity for the North to feel the benefits even sooner. In last week’s spending review, the Government confirmed a £13bn investment in northern transport projects over the course of the parliament. Osborne said: “In my Spending Review we committed to the biggest rise in transport spending in a generation meaning that major projects like the construction of HS2, to link the Northern Powerhouse to the South, can begin. £200m has been set aside to invest in supporting the newly created Transport for the North (TfN), which has just been appointed John Cridland – a former CBI director general – as the first chair. Cridland commented: “There is much to do to improve transport capacity and links across the North, and we now have the opportunity to make this happen.